Is there a home advantage in Pro Kabaddi League 2018? The Pro Kabaddi 2018 commenced on the 7th of October. We are halfway through the three-months-long league. In case you didn't know, PKL made a debut into the sporting world in 2014. Season 1 had eight teams participating from all across India. Abhishek Bachchan's Jaipur Pink Panthers faced off against their arch-rivals U Mumba in the finals and went ahead to become the inaugural champions of the first season of PKL. The second, third and fourth season had the same format of matches with some minor changes, where U Mumba won the second edition of the league against Manjeet Chillar's Bengaluru Bulls. Coming from the eastern part of the country, Patna Pirates shell-shocked everyone by winning the third and fourth seasons of the league. The mojo player Pardeep Narwal was a revelation as his contribution was substantial in the Pirates' victory. Well, things started changing from the fifth season. Four more teams, i.e. 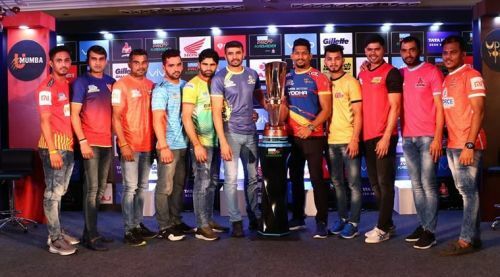 Haryana Steelers, Gujarat Fortune Giants, UP Yoddhas and Tamil Thalaivas, were added, making it a total of twelve teams coming from all over India. The duration of the league was also extended to three months. Patna Pirates made history by winning three consequent leagues. Also, PKL 5 was the most viewed non-cricketing event in India. It was even stated as the biggest league in India, surpassing the IPL. Now, these twelve teams get a chance to play six matches in their home leg. But the big question here is, is the home leg of utmost importance? In the past five seasons, teams competed to win the most number of matches in their home leg, for their fans. "Fans" are a major part of the game. There is no Pardeep Narwal or Rohit Kumar or Ajay Thakur without those crazy fans who cheer for them no matter what. Likewise, the league would still have been underrated if the fans never supported the league whole-heartedly. Have you ever witnessed a live match in the stadium? If you haven't then let me tell you, the atmosphere is stoked, euphoric and crazy. Every raid is embraced by the fans, even if it is empty. Home leg stats were pretty shocking this year. Tamil Nadu was the home to the first six matches of the 2018 season. Tamil Thalaivas, despite having a massive amount of support, failed to make a mark. They lost five out of six matches, which is highly disappointing. Haryana Steelers won just two matches out of six, that too in their home leg. Moving on, Pune had an almost successful home leg after winning three matches. Defending champions Patna Pirates, on the other hand, made a pretty bad impression. They just won two matches out of six in Patna. UP had an even worst experience as they did not win any match while playing in Greater Noida. Ouch! Well, things started changing from the Mumbai leg. They successfully won four matches, which was good. Finally, the "losing jinx" was broken. Gujarat had the same number of wins as the latter. Both teams made a mark and are seen fighting for the first spot in the PKL Points Table. Bengaluru being the next, won three matches out of six in total. Currently, the Delhi leg is being played at the Thyagaraj Sports Complex and the team has given us some shockers by winning two matches out of three, that too from teams like Puneri Paltan and Jaipur Pink Panthers. Will they be winning the rest of the matches? Well, no one knows. In the end, home legs hold an important value but with fans cheering like crazy, players do get a massive pressure to perform. It would be interesting to see what teams qualify for the playoffs this time.